The Environment Preferences tab allows organizations to set maintenance windows for VividCortex agents, as well as the timezone for your environment. You can also select to delete query samples, or delete the environment entirely. There is also a page to create API tokens in each Environment. These allow you to configure two kinds of events: long-running query events and PostgreSQL autovacuum events. Enable long running query detection will have VividCortex generate an Event for every thread we detect that has been executing for longer than the defined threshold (in seconds). You can then use these events to trigger an Alert. This setting will enable detection for all hosts in the Environment. If you would like to enable this for only some hosts, or exclude some hosts from this option, see our Event documentation which contains more information about per-host configuration. Postgres vacuum events will have VividCortex generate two events, one with a warning level and one with a critical level, if we detect that the autovacuum has run for longer than the configured duration. You can then use these events to trigger an Alert. This setting will enable detection for all hosts in the Environment. If you would like to enable this for only some hosts, or exclude some hosts from this option, see our Event documentation which contains more information about per-host configuration. The Query Data tab of Environment Settings allows you to control the capture of query samples in VividCortex, including enabling and disabling sampling or configuring a safelist or blocklist. More detailed information about controlling query samples, as well as instructions for enabling these settings on a per-host basis, is available in our Query Samples documentation. Enable sampling lets you enable and disable sampling entirely for all hosts in the Environment. When sampling is enabled, you can select to only capture query execution metadata and EXPLAIN plans by checking the box. Force off host samples instructs the agents to attempt to enable the performance_schema consumers necessary to collect query samples when monitoring off host if the consumers are not enabled. The agent will need the UPDATE grant on performance_schema.setup_instruments. This is useful as RDS and Aurora do not have configuration options available in AWS to keep these consumers enabled after a database restart. Blocklist / Safelist allows you to configure a regular expression controlling what samples to exclude or capture. Query comments allows you to capture the query comments from a query sample while discarding the raw query text. This option is a regular expression describing what part of the comment to capture. Enter * if you would like to capture all of the query comments. This feature is only available for /* ... */ style comments. To reiterate, enabling this option will capture the query comments but NOT query text. Query tag delimiter enables data collection by query tag. More information about query tags can be found here. Agents Maintenance Windows is a Premium-tier feature which allows organizations to schedule acceptable time windows for updating VividCortex agents. By default, the agent periodically checks whether new versions are available. If updates are available, the new version is automatically downloaded and installed. This ensures organizations always have the latest bug fixes and optimizations. Some customers, however, prefer a known timeframe for updates. 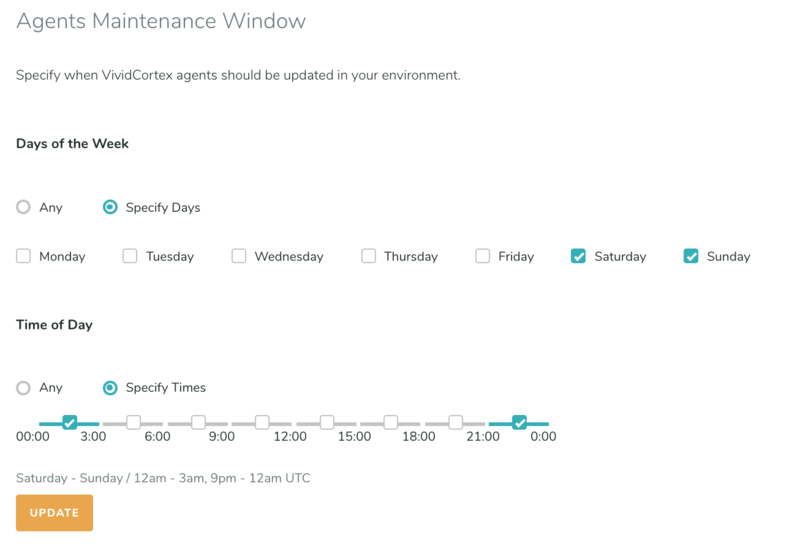 VividCortex wants its customers to always use the latest software, and with maintenance windows, users can schedule weekly times that are acceptable for updating. This provides the flexibility for organizations restrict when agents may be updated, while ensuring organizations continue to get the latest bug fixes and optimizations automatically and in a timely manner. By default, agents are set to be updated at any time. If this is acceptable, then there is nothing to be done, and agents will be updated as they previously were. If you wish to restrict the days and times you want to update, select days and time windows. From the Environment Preferences page you can delete all of the raw query samples captured so far in this environment. This includes sample metadata (connection ID, user, etc. ), EXPLAIN plan, and the query text itself. This does not delete query digests. For more information about query samples, see our query sample documentation. Click the button marked ‘Delete Samples’ to remove all samples. Samples can not be restored once deleted.